over the past year, japanese curry over rice has become one of my go-to comfort foods. our company orders from sushi zushi (!!) at least once–if not twice–a week for lunch. my go-to order has typically been katsu curry with rice or pork katsudon. despite me eating curry rice at least once every other week, i still don’t get tired of it. 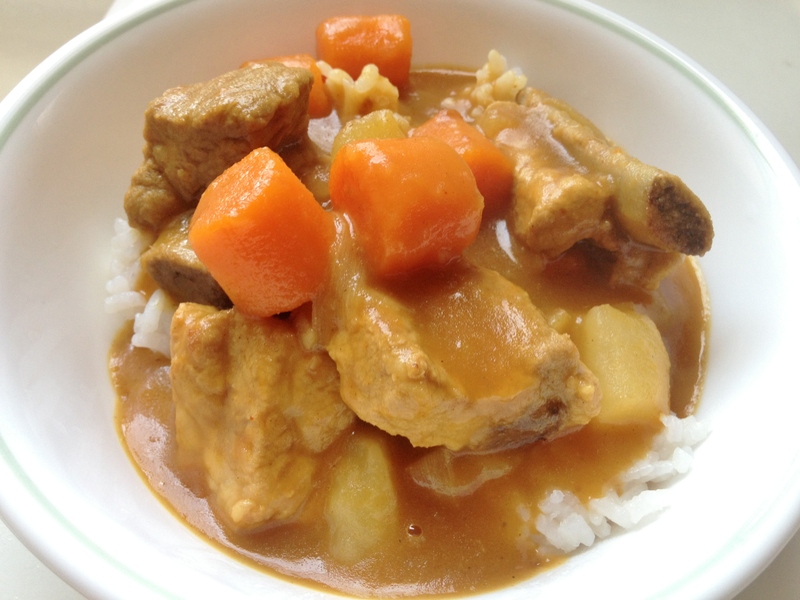 this sunday, i made japanese curry with pork spare ribs for family dinner. directions? follow the box. no seriously, it’s so easy to make even ben can do it! you literally just follow the instructions on the box. 1/2 package (or 125 grams) of japanese curry sauce mix [see picture below]. Can be found in the Japanese aisle of a grocery store. The brand “Golden Curry” also works well too. For the pork spare ribs, you’ll want to boil them in water for 5-7 minutes until the majority of scum and solids is released. Drain and rinse the meat under cold water one more time so that they are completely free of scum. Saute the onions, carrots, and potatoes in EVOO for 3 minutes in a large soup or stock pot. Add the meat and 3.5 cups of water. After the stock comes to a boil, reduce the heat to a medium low, cover, and cook for 20 minutes. After 20 minutes, add the curry mix into the stock, stirring until there are no more large curry chunks. Cook for an addition 20 minutes. Serve over a bowl of white rice. And you’re done!